I started bullet journaling in November. Throughout these 2 months, I’ve realised so much about it. I’ve been thinking of doing bullet journaling for a long time, since I was still using a planner and struggling to find a planning system that works for me. When I started journaling and was combining planning into my journal, I was still thinking of doing bullet journaling. I did lots of research and found it too intimidating for my skills, so I kept putting it off, until one day I found out that there’s no need to be extravagant. Bullet journaling is simple and can be done easily without much artistic skills. My drawing skills is very limited, so I don’t draw much. I do put in colour to my spreads but it’s mostly just lines and dots. The many well crafted artistic spreads are the reason I was putting off starting bullet journaling until I found out that there is no need for drawings. I do not know calligraphy. I don’t even know how to write cursive, so all my words are in my regular handwriting. All the fanciful fonts are what made me put off starting a bullet journal but there is no need for any fancy handwriting. Just one regular handwriting is enough. My bullet journal consist of only three types of spreads, calendar for the month, habits tracker and the weekly spreads. There are many other types of spreads for the month, for the year and for tracking. Doing all these spreads seem daunting with my skill level that’s why I was putting off starting a bullet journal, oblivious to the purpose of it. There’s a reason why a bullet journal is highly customisable because it’s fully customised to our needs. Since I don’t need those spreads, there’s nothing to be daunted about. Drawings, calligraphy and a bunch of spreads are just extras to be more decorative. Without the drawing, calligraphy and a bunch of spreads, the bullet journal becomes easy to create. My spreads have little to no drawing and completely no calligraphy. I did not do any setup when I started the bullet journal and there’s no setup for the new year too. It all depends on the individual. Bullet journaling can be artistic, with drawings, calligraphy and a bunch of spreads but it can also be simple with no drawings, no calligraphy and minimal spreads. Everyone can bullet journal whether artistic or not artistic. As much as I try to stay occupied everyday, be motivated, productive and make my days fulfilling, there will definitely be days when I’m still tired even after a good night’s sleep and all I feel like doing is laze. I used to just let myself get into the lazy mode and laze all day but such days will get me overthinking which will make me fall into a depressive slump. So what I do now is give myself an afternoon to laze but in between lazing, I’ll do things to motivate my tired self. After an afternoon of lazing and motivating myself, I’ll be ready to be productive in the evening. Although I’m only productive in the evening, at least I still did a little something while getting the rest I needed. So how do I motivate my tired self? Sometimes when I’m procrastinating on something, I’ll journal and write in it that I have already got that something done or I’ll be doing it. It’s like a promise that I’ll do it and since I’ve made a promise, I’ll most likely do it. Other that writing down my promises, I’ll write my thoughts and happenings as well like how I usually journal. By journaling, it simulates my mind which will and me feel more awake. Music is a great motivation booster but not just any music. It has to be upbeat music that will make me get out of lazing and start dancing. With that bit of moving through dancing, I would have gotten into the momentum of being up and about which will motivate me to start being productive. Essential oils feels like magic to me. Sometimes my head feels weird when I’m tired but this weird feeling magically disappears after just a few minutes of deep breathing the air infused with the essential oil. With that weirdness in my head gone, I’ll be more awake and ready to be productive. Sometimes the tiredness and weird feeling in my head is due to dehydration. As much as I try to drink sufficient water everyday, there will still be days when I unknowingly don’t drink enough water. Once I’ve drank enough water and I’m hydrated, I’ll naturally feel more awake and the weirdness in my head will be gone. Water seems to be another magical liquid. Quotes are my source of motivation as I’ve mentioned before and is my go to way for motivation no matter what mood I’m in. It may or may not motivate me to be productive because it all depends on the quotes I come across. Some quotes will trigger me to suddenly get up and get going but sometimes the quotes I read don’t have any motivational effect at all. So that is how I try to motivate my tired self on days when all I want to do is laze because I’m tired, to prevent myself from overthinking and falling into a depressive slump. Although sometimes I’m eventually still not productive, at least I’m still keeping myself occupied by motivating myself such as journaling, listening to music and reading quotes. This is an extremely long overdue post which I mentioned last year I’ll be doing when I did the day in my life post on my typical day. That post involves going out and since there are also typical days when I don’t go out, I thought of doing another day in my life post on a stay home day. Finally here’s the stay home day in my life post but this day turned out to be different from what I originally thought so that means I’ll be doing another stay home day in my life post. Hopefully that post won’t come a year later again. 10.30am: I finally got out of bed after I’ve woken up and lazed a little. The time I wake up varies between 8-11am but on the day I documented this day in my life, I woke up at 10.30am. The routine is standard no matter what time I wake up and this has been my waking up routine for years. I’ll go straight to the bathroom to brush my teeth and wash my face. Then I’ll go back to my bedroom to put on my glasses. Sometimes I’ll make my bed. After that, I’ll go to the kitchen to get a cup of water and relax on the couch in the living room while I drink my first cup of water of the day. This is the time I’ll look at my phone, scroll through social media and check my messages. 11am: It’s breakfast time. What I eat varies but on the day I was documenting it, I had oatmeal which is what I mostly have for breakfast. 11.30am: Even with the cup of water, looking at my phone and breakfast, I still don’t feel fully awake because what truly sets the start of the day is coffee. This is the time I’ll have my daily dose of coffee while I relax on the couch and read. Coffee time is also my reading time. 12 noon: Finally I’m ready to get my day going although it’s already afternoon. For me, an afternoon is usually enough to get most of what I’ve planned done but I didn’t have much planned on the day I was documenting this day in my life, so it turned out to be more of a chill day which was different from what I originally thought. So I’m thinking I’ll do another day in my life for a busier stay home day because everyday is different. Some days are hectic and some days are more relaxing. I’ll start off with diffusing an essential oil before checking my journal to see what I’ve planned for the day and as I’ve mentioned above, on this day I didn’t have much planned. After that, I’ll turn on my computer and work on my blog and it’s related tasks. I try as much as possible to plan something everyday relating to my blog. I’ll usually be on the computer for about 2 hours but since I didn’t have much planned, I got what I wanted to do quite quickly. So I ended up spending the rest of the time tidying my room and rearranging my things. 2.30pm: At this time I’ll have lunch. What I eat varies but on this day I had instant soup with crushed noodles which I know is not healthy. At least my breakfast was healthy and my dinner would be healthy. While I have my lunch, I like to watch videos on YouTube. Actually for most of my meals, I’ll watch videos while eating. 4pm: I’ll always have 2 cups of coffee or tea a day. One is of course my morning dose of coffee and the other will be in the mid afternoon. Usually I’ll have tea but sometimes it’s a second cup of coffee. On this day, I decided to have green tea. If I have plans to work on using the computer, this is the time I’ll continue working on them. Since I didn’t have much planned and have completed what I wanted to do earlier in the day, I spent this time journaling and reading. 6.30pm: This is my household chores time. On days when I have chores planned to do, this is the time I’ll get them done. On this day, I had one chore in my agenda which was mopping the floor. Mopping is a perspiring chore, so I’ll relax on the couch with a cup of water after I’m done before going to shower. 7.30pm: Dinner will usually be ready for me after I’ve showered. By ready for me, it means my mom is home from work and have bought dinner for us. We usually have takeaway dinner that my mom will buy on the way home from work but sometimes I’ll buy if I happen to be out at close to dinner time. I’ve mentioned above that I like to watch videos on YouTube while I have my meals but for dinner, I’ll always watch television because shows that I fancy are always on in the evening. Unless there are no shows that attracts me, then I’ll watch videos. Even after I’ve finished eating, I’ll continue to watch television unless there are no shows that I like. On this day, there are shows that have me watching until 10pm. 10pm: Should there be plans to work on using the computer, this is the time I’ll continue to try and complete my agenda. For this chill day with no plans, I spent the time colouring. 11.30pm: It’s almost midnight and it’s time to wind down. My routine to end the day starts with journaling, writing down any thoughts that I have to clear my mind, ticking off my completed plans, sometimes crossing plans that wasn’t done and scheduling it for another day. After that, I’ll brush my teeth and do my night skincare. Then I’ll diffuse an essential oil, lay in bed and be on my phone which I know is recommended to avoid before bed but it’s not a problem for me to be on my phone before bed since it doesn’t affect my sleep. 1am: It’s finally lights out after I’m done with my routine and have enough of scrolling through apps on my phone. My actual turning off the lights and going to bed time varies but usually it’s between 1am to 2.30am. So that is my chill stay at home day which I didn’t expect to be so fulfilling. Despite having little plans, I still felt productive. Probably cause I did quite a few therapeutic things, colouring, reading, diffusing essential oils and kept my day fully occupied which is what I’ve been trying to do. This is the type of day that would have got me overthinking and get into a depressive slump. I just wrote a post about how to stop overthinking and stop being depressive. One of my ways was to stay occupied and I’m so proud that I’m putting my ways into practice. After going through several cycles of depressive slumps, I’ve decided I need to stop and have started making changes. One of the causes of getting into these depressive slumps is overthinking and I’ve incorporated a few habits that have helped me stop constantly overthinking. I recently ditched my organized planner for a messy journal which I’ve wrote a post about. I’m into my third month of journaling and it has helped me so much in controlling my thoughts. Through writing, I’m letting out all that’s on my mind. It doesn’t have to only be depressive thoughts, it can be happy thoughts or happenings as well. Having all my emotions written down in the journal makes my mind clear. This is something I’ve been doing for a few years but in the recent few months, I seem to have fell off it. When I decided I need to stop constantly going into depressive slumps, I got back into reading quotes. I’ve mentioned many times before that quotes are my source of motivation. Not only does it motivates me, it also gives me the confidence and helps me believe in myself. I used to always think life is boring and there’s nothing to do but actually, there are plenty of things to do. Since I’m a homebody, my mom always asks me if I’m bored. Although I always say that I’m not, it’s only now that I feel I’m truly not bored and have realised there actually are so many things that can be done at home. Procrastination is really a very bad habit. Sometimes the depressive slumps and overthinking are caused by procrastination. It’s not only a thing that I’m putting off and waiting to do later, sometimes it’s many things. Sometimes it’s not procrastinating for hours but days because I’ll become lazy, start overthinking everything while lazing around and eventually fall into a depressive slump. Now I try not to procrastinate and by not procrastinating, it helps with staying occupied since I’m doing something. I’m actually always aware that I’m in a depressive slump and that I’m overthinking but I always let myself stay in that state for awhile before unknowingly getting out of it. Although I want to stop getting into depressive slumps and stop overthinking, it doesn’t mean that’s not happening anymore. There are still days when I overthink everything and get depressive but instead of letting myself get into the slump, what is do now is pep talk myself out of it. So these are a few ways I’ve been doing and trying to do to beat the depressive slumps and reduce overthinking. As I’ve mentioned above, I do still get depressive and overthink but instead of being in a slump and lazing for days, most of time it’s just an afternoon now which is a huge improvement. The afternoon will then be treated as a break to be lazy for a few hours once I’ve managed to journal, read quotes, stop procrastinating, pep talk myself out of it and be occupied with something. This month last year, I did a what’s in my bag post. Now a year later, lots have changed. Although most of the contents in my bag are still the same, there are still several changes. Most of the changes happened quite recently, about two months ago. Starting off with the bag itself, it’s a completely different bag now. My most frequently used bag was the nerdy small backpack but now that has changed into a larger bag to accommodate the increasing amount of things I carry around and this bag is not nerdy at all. I’m still into the nerdy style but not as much as before. This is the bigger bag that I most frequently use now. It’s not new. I’ve had this bag for many years already and used to carry it often when I was still schooling. After a few years out of school, I need this bag to be my frequently used bag again but for a different purpose. I organize most of my things into pouches and most of the pouches have changed. The is one of the many changes to my pouches. I used to carry two wallets to accommodate the ton of cards that I have before trying to combine everything into one wallet which became very bulky. I’ve actually been thinking of getting a larger wallet and slightly more than a month ago, I finally got this pouch as my wallet. With the wristlet on the pouch, it makes certain things more convenient for me, especially when I’m at work and a crowded cafe. When I’m out to buy food or go to the restroom during breaks at work, I used to carry my wallet, tissue and phone all in my hand which makes it difficult to take money out of my wallet or use my phone without being clumsy. With this wristlet pouch, there’s no clumsiness because I can even put my tissue and phone in the pouch although I use it as a wallet. The same applies when I’m at cafes. I frequently patronize cafes and it’s always crowded, so I’ll always leave my bag on the seat to reserve it. Instead of carrying a bunch of valuables in my hand to go buy my drink at the counter, I can put everything into one pouch. What I have in my beauty pouch never change. It’s still the basic beauty essentials such as comb, hair ties, lip balm, perfume and a cloth to clean the lenses of my glasses but the pouch itself has changed. In addition to that, I now carry another bigger beauty pouch which contains my eczema essentials. It’s uncertain when the eczema will flare up with itchy or red flaky patches, so I’ll need those creams on hand even when I’m out in case there are flare ups. I always bring a earpiece out which I mostly use to listen to music on long public transport rides but now instead of one earpiece, I bring two earpieces. One is the wired earpiece which I’ve always been using all along and the other is a Bluetooth earpiece which I recently started using for my Apple watch. Those two earpieces are together in a pouch. The other electronics pouch contains a powerbank and my phone’s charging wire. I seldom bring a powerbank out before but since I started playing a game that drains the phone’s battery quickly a few months ago, I always have a powerbank in my bag. As mentioned above, I’m frequently at cafes and usually I’ll play that battery draining game. So I’ll need the powerbank in case my phone battery becomes low even before I’m ready to leave the cafe. The next few items are not in pouches but they are essentials that I usually bring out. Since being diagnosed with eczema, I’ve been very conscious about what my skin is exposed to and that includes the weather. An umbrella is of course for the rain and the cap will be for the sun. Sometimes I do use the cap for the rain as well, if it’s only a drizzle. I’ve been bringing a water bottle out since I started trying to drink more water towards the end last year. It wasn’t frequent when I first started bringing water out and was using the small backpack but now with my larger bag, it has become a habit to have a bottle of water in my bag. Tissues is very much self explanatory since it’s a basic essential for several purposes. Usually I’ll only need the dry tissues but there are times when I’ll need the wet tissues as well, so I bring it just in case. I never had the habit of bringing candy out until recently. I think it all started because of my poor sleep and coffee not having any effect on me anymore, so I need candy to help me stay awake. I’ll have coffee candy most of the time but occasionally I do have other candies. As mentioned above, I frequently patronized cafes and there are several things I’ll do when I’m there. Those several things includes reading and using my tablet. Although I mostly use my phone, there are a few games and apps that are on my tablet. So I’ll bring the tablet as well just in case I want to play the games or use the apps that are on there. This is linked to patronizing cafes frequently as well. Although I’ve only been journaling for more than a month, sometimes I do write in my journal when I’m at the cafe. Journaling has since been included in the list of things I’ll do when I’m at cafes. Of course I’ll need my stationary to journal, so I need to bring that as well. When I was using the small backpack, I seldom put my phone in my bag. It was always on my hand or in my pocket because one, I feel insecure having my phone behind me and two, it’s troublesome to take my phone out of my bag. Now that my bag is on my side, I’ve been putting my phone in my bag since I no longer feel insecure and it’s not troublesome anymore as I don’t have to take my bag off my shoulders to get my phone out. As compared to last year’s What’s In My Bag, there’s so much more things in my bag now which is why I need a larger bag to fit those additional things. I did continue using that small backpack when I first started having more things to bring out but it eventually became too full and things that were at the bottom of the bag were hard to take out without getting frustrated. To ease my frustration, I decided I needed a larger bag and that inspired this updated What’s In My Bag post. I recently started being diligent with my skincare after I’ve been diagnosed with eczema which as mentioned in a recent post about the importance of skincare, made me realised how important skincare is. 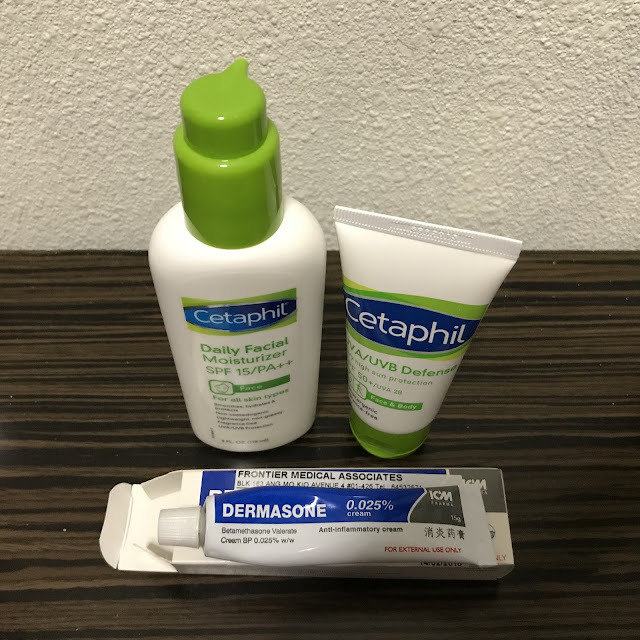 I’m advised to moisturise multiple times a day and with the several product recommendations, I’ve established a skincare routine, using different products throughout the day. It’s has always been a habit for me to go straight to the bathroom to brush my teeth and wash my face after I wake up but a change I’ve made since being diagnosed with eczema is washing my face with a facial foam. I used to only wipe my face with a damp face towel but now I use the Cetaphil Gentle Skin Cleanser to wash my face before wiping. After washing my face, I’ll moisturise it with the Cetaphil Daily Facial Moisturiser. This has SPF 15, so it also works as a sunblock if I’m going out. After moisturising, I’ll apply the steroid cream prescribed by the doctor on the areas that are red, dry and flaky. Despite having moisturise in the morning, my skin does get dry and flaky in the middle of the day. When that happens, I’ll apply either Vaseline or Aloe Vera to soothe the skin. If I’m going out, I’ll make sure to bring the Vaseline and Aloe Vera to apply on the go if my skin becomes dry and flaky. Since steroid creams cannot be used too often, that’s why I use Vaseline or Aloe Vera for the rest of the day to soothe my red, dry and flaky skin. The Aloe Vera’s in a huge tube but of course I’m not going to bring a big tube when I go out, so I transfer some into a small container to put in my beauty pouch. I’ve been advised to shower more often but I still stick to showering once a day and my habit has always been to shower at night to end my day. I’ll definitely wash my face when I shower using the same Cetaphil cleanser and I’ll apply Aloe Vera to my whole face after showering. The night is when I finally care for my body. I do have eczema on my body but it’s not as serious as my face and the condition have improved tremendously since the visit to the doctor, so I only care for my body once a day. 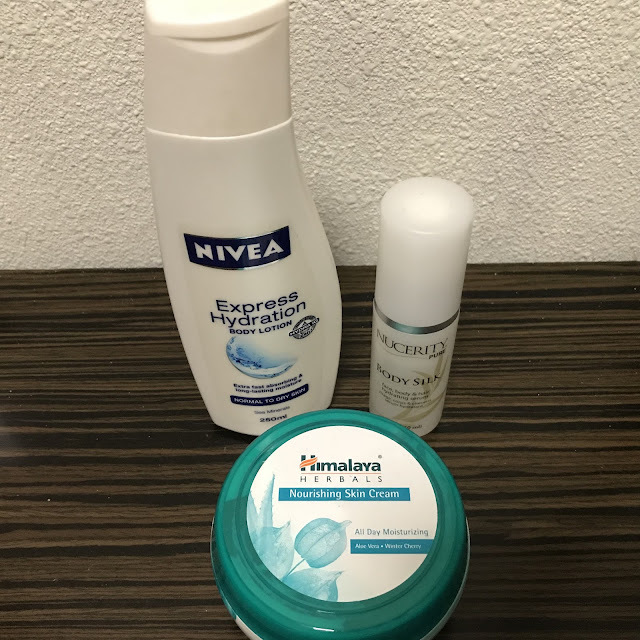 I’ll apply either the Himalaya Nourishing Skin Cream or Nivea Express Hydration body lotion on my arms and legs before going to bed. So that is my full skincare routine which I’ve actually been into for only half a month. When I was first diagnosed with eczema, I was taking in recommendations and experimenting with what work’s well for my skin until half a month ago, I decided I’m too overwhelmed with products and wanted to have a fixed routine that incorporates all the products I’ve got. I’m very happy that this routine has given my skin positive effects, especially my face which didn’t seem to be healing. Now my face is almost healed and the flare ups on both my face and body have reduced significantly. I’ll definitely keep going on with this routine and most likely keep repurchasing these products which I’ve done for the Himalaya Skin Cream and Nivea body lotion. I love nature, especially sea views. My love for sea views sparked my love for cruises. I’ve been going on cruise weekend getaways frequently since 2013. Now that I’m writing about it, I’m amazed that it has been 5 years and I still look forward to going on cruise. When I first started cruising frequently in 2013, it was almost every month but as the years ago by, the frequency became lesser. In the last 2 years, I’ve only cruised about 3 to 4 times a year. In the 5 years, I’ve been on 4 ships which means I go on the same ship many times and even though it’s the same ship, I still look forward to every cruise trip. The ship I went on in 2013 was Superstar Virgo. This ship was homeported in my country for many years. Before I started going frequently, I’ve actually been on that ship a few times in the early 2000s when I was still a child. This is from one of my trips in the beginning of 2014, a few months before the ship relocated. I went out of the ship for a walk around the port the ship was docked at. After more than a decade in my home country, Superstar Virgo relocated in 2014 but another ship from the same cruise line came to be homeported and my frequent cruises continued on Superstar Gemini. This is from one of my trips in 2015, up at the open deck which is my favourite deck of the ship. I like to walk round and round this deck while I admire the sea and the landscape, especially when the ship is docked in the middle of the sea and there’s a view of the city. This is from one of my trips in 2016 when I was up at the open deck during sunset which is another of my favourite nature views. With two of my favourite views at the same time, that’s an amazing sight! After 3 years in my home country, Superstar Gemini relocated in 2017 and again, another ship came. This ship is actually a brand new ship which was just built with a new cruise line. So my frequent cruises continued on Genting Dream. Since this ship came only at the end of 2017, I’ve only been on it twice. This is from my first trip on Genting Dream in December last year and again, walking round and round up at the open deck while admiring the sea is my favourite thing to do. This is from my most recent trip on Genting Dream, just last weekend. I was admiring the sea from my cabin’s balcony. I normally get the cabin without any view of the sea since it’s cheaper but recently there hasn’t been any availability for the inside cabins so I decided to get the balcony cabin. In 2016, I went on Royal Caribbean for the one and only time when Mariner of the Seas had cruises from my home country. That was the only time I went on a long cruise, more than just a weekend getaway. I was snapping the ship from a boat when the ship was docked in the middle of the sea and we needed to take a shuttle boat to get to the shore. Besides the sea view, there are also other reasons why I love going on cruise. Not only is it a getaway, being on cruise allows me to be in a completely relaxed state of mind. I can wander around freely throughout the ship without worrying about anything. Since the ship is only so big, I definitely won’t get lost. Being out at sea makes the phone have no service half the time, which means my phone is not usable because I’ll be uncontactable and I have no internet connection. It’s a good break from the phone! The ship does have Wifi actually but it needs to be bought and it’s expensive. I would rather take the opportunity to stay away from my phone since I’m on it almost all the time back home. So that is my story about how I fell in love with going on cruise and a little insight on the ships I’ve been on. Despite going on cruise so many times already and just returning from a cruise, I’m still looking forward to my next cruise. For now, I can still only go on short cruises around my home country but I’ve had this dream for quite some time to go on cruises at other parts of the world. Hopefully one day I’ll be able to fulfill this dream and have a view of the sea on another part of the world! Caring for my skin and hair has always been a struggle for me. I would be in the routine for awhile before stopping for months and although I’ve always wished for it to become a daily routine, I’ve never succeeded in making it a daily routine until now when I’m having skin problems. In a recent post written this month about my skin problem, I admitted that I’m quite lazy when it comes to the beauty aspect of life. Although I still don’t know what is really causing it, I highly suspect that it’s because I never maintain my skin with a skincare routine that’s why I’m having eczema now. It’s definitely a lesson learnt that skincare is so important since the condition of my eczema has improved after moisturizing frequently. But is it too late that I’ve only just realized how important skincare is? No, I believe it’s not too late since I’ve managed to improve my condition by moisturizing everyday. Although I could have prevented myself from having eczema if I’ve realised this fact earlier, what’s done is done and I don’t want to live life with regrets that I should have took proper care of my skin. Skincare is important not only to prevent skin problems, there are so many other benefits of maintaining the skin with a proper skincare routine. Having a moisturized face helps prevent makeup from getting clogged and flaky. Although I’ve realized this few years ago, I still failed to make skincare routine a habit. Probably because I’m not into makeup so I didn’t bother about keeping my face moisturized. Although I’m confidently embracing my skin problem now as mentioned in the recent post about my skin problem, it would of course be better if I didn’t have any skin problems. I will admit that confidently embracing my skin problem doesn’t mean I’m not bothered by the problems at all, especially when the condition on my face is the most serious. How the skin is cared for at a younger age affects the future, the older age. As age increases, the body changes and so does the skin. An older skin will become dull and wrinkle but with proper skincare at a younger age, the process of the skin aging to become dull and wrinkle will be slowed down. How the skin looks in the future depends on the skincare now. I have been told years ago that after 25 years old, skin will react differently and signs of aging will start to appear if i don’t do anything about it. Omg, now that I’ve thought about that, I’ve realized more about why I’m having skin problems. Since I didn’t care for my skin before I was 25, my skin has started to react negatively now that I’m already past 25. So it’s high time I take proper care of my skin to prevent more negative reactions. Through this lesson, I’ve been actively giving my skin proper care. It’s been more than a month and I’m still going strong with washing my face with a facial foam and moisturizing it at least twice a day. Since the problems on my face are more serious, I care for it more but for my body, I’ve managed to at least moisturize once a day everyday. Since I live in a tropical country and the sun will make my eczema flare up, I always make sure to be protected with sunblock whenever I’m going out. Finally I’ve succeeded in making caring for my skin a daily routine and maybe I should start caring for my hair as well before it becomes problematic like my skin. I’ll start with how my eczema began which is the skin problem I’m having. I’m not sure when but definitely at least half a year ago, my legs were constantly itchy. At that time, I didn’t think much about it and just kept scratching whenever I felt itchy. This resulted in my legs having lots of scars now. Few months later my face started breaking out. Red flaky patches formed around my mouth. I didn’t think much the first time I saw these red flaky patches and it healed quite quickly. My suspicions started when those red flaky patches kept coming back. It healed quickly for about more than a month before becoming serious and didn’t show signs of healing even after almost a month. Since I work in retail, I often get questions about what is happening to my face and was advised to see the doctor when regulars who patronize frequently saw that my skin still had not healed after almost a month. I spoke to my mom about it and she agreed that I should see the doctor. When I finally decided to see the doctor, my hand had already flared up a little. I only showed the doctor my face since that was the most serious and it was my purpose of going to the doctor but after examining my face, the doctor happened to see the few red patches on my hand that was on the table. She then went on to examine my whole body and diagnosed me with eczema. After the visit to the doctor, I would tell them it’s eczema whenever customers from my retail job ask me about my face. Then there would be a next question about the causes of my eczema. Before I visited the doctor, I don’t know what was happening to my skin. After visiting the doctor, I don’t know what causes my eczema. It’s been a month since being diagnosed with eczema and I still don’t know what’s causing it but I do have my suspicions. Out of the many possible causes, I’m suspecting it’s either an allergy to certain food, beauty product or improper skincare. Regarding improper skincare, I’ll have to admit that I’m quite lazy when it comes to the beauty aspect of life. I seldom moisturize which why I highly suspect that’s the reason I’m battling eczema now. I’m actually quite surprise at how much I’m moisturizing now. I was advised by the doctor to moisturize multiple times a day. In fact, I’ve also saw moisturizing multiple times a day on many articles while I was researching on eczema. Since then, I’ve really been moisturizing both my body and face multiple times everyday. At first I thought it was going to be chore to moisturize multiple times everyday when the doctor told me that but I immediately ease into it. Along with my new moisturizing habit, I changed the products that I used. Since my face is the most serious, I opted for something gentle as advised by the doctor, other people I’ve met and through research. I’m now using mostly Cetaphil products. Other than my moisturizer and sunblock as pictured, I’ve also switched my facial wash to Cetaphil. To sooth the red, flaky and itchy patches, I’m using the steroid cream prescribed by the doctor. For my body, I’m using the Himalaya nourishing skin cream that I was previously using on my face. Since it can be used on the body as well, I decided not to waste it. There’s actually still so much left since I was only moisturizing once a while before. I was using the Nivea body lotion on my body previously but since I was only moisturizing once in a while before, there’s still so much left. Although I have lots of moisturizers for my body now, I believe it will all be used up soon with how much I’m moisturizing now. As for allergies, I experienced a flare up on the almost healed red and flaky skin around my mouth after eating spicy food. I’m not sure if spicy food is the cause but I’ll experiment it again when the skin heals. Although I’m still in the process of finding out what food or chemical in a product is causing my eczema, I’m glad that my condition is better now. I don’t get red itchy patches on my body as often now and I’m embracing my skin. I’ll admit that having eczema did affect me mentally as well because of how my skin looks with scars, scratches and the red and flaky patches. I remembered there was a week when my eczema was so serious until I stayed home the whole week. There was one day when I tried to hide myself at work and not serve any customers. Seriously, I should have just taken a sick leave that day. There was a point when I was so frustrated of answering questions about my face. Soon after though, I thought it all out. Through research and hearsays, I found out that eczema is a common problem so I shouldn’t be afraid. Now I’m confidently embracing my skin problem and taking care of my skin with a proper skincare regime. Despite having the scars, scratches, red and flaky patches, I still wore shorts and tank tops. I go out whenever I want, no matter how much my skin is flaring up. I don’t try to hide from anyone. I’ll answer all questions that I get and accept any advice. If I feel the advice is beneficial, I’ll put more thought into it. If not, I’ll just brush it off. So that is my eczema story and how I’m embracing it. Although sometimes I feel torturing when my whole body itches, I’m going to embrace it. Although moisturizing has become a habit, I’ll admit that there were a few times when I felt it a chore which I’ll embrace as well. It’s definitely a lesson learnt that daily moisturizing and proper skincare is so important, especially since the condition on my body has improved so much from all the moisturizing. As for my face, I think there may be other problems other than not moisturizing which I have suspected I may have an allergy.